The City of Santa Cruz Wastewater Treatment Facility won four regional awards from the California Wastewater Environment Association-Monterey Bay Section: Overall Plant of the Year, Plant of the Year (Medium), Collections Person of the Year and Operator of the Year. The awards were presented at the section’s 62nd Annual Awards Banquet on Feb. 9. The regional Plant of the Year (Medium) award acknowledges outstanding achievement in more than 20 categories honoring exceptional treatment plants, water environment professionals and collection systems. It is based on a review of infrastructure, management practices and compliance records. The Overall Plant of the Year award recognizes the Wastewater Treatment Facility for its services as a regional wastewater treatment and disposal facility that include lab support and testing for other facilities. 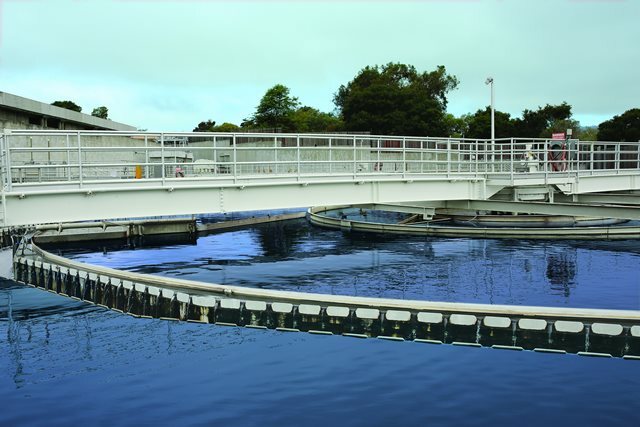 The Santa Cruz Wastewater Treatment Facility is the only plant in the Monterey Bay area permitted for this work. The plant also provides wastewater treatment and ocean outfall disposal beyond the City of Santa Cruz to the Santa Cruz County Sanitation District including Live Oak, Capitola, Soquel and Aptos and provides solids processing and ocean outfall disposal for the City of Scotts Valley. Wastewater Collection Field Crew Leader James Locatelli was names 2017 Collections Person of the Year for his efforts in managing sewer collection system work crews and staff development. Wastewater Treatment Operations Supervisor Dave Meyers was awarded 2017 Operator of the Year for his dedication to excellence in process control, staff training, work flow management and service beyond the call of duty. The Plant of the Year (Medium) award declares the City of Santa Cruz Wastewater Treatment Facility a contender for California Wastewater Environment Association 2017 Best in State award to be determined this spring—an honor that the plant received in 2013.